For practitioners dealing with cases involving health and safety issues at work, this book will be welcomed as a thorough and up-to-date guide on available approaches. Of especial value is the detailed coverage of the scope of the safety obligation, the consequences of its violation, workers’ representation, and the link between occupational health and safety and the fight against harassment at work. Chapter 1 Occupational Health and Safety: An EU Law Perspective; B. Valdés de la Vega. Chapter 2 Occupational Health and Safety in Austria: ‘The Labour Inspectorate Is Watching You’; E. Kohlbacher, F. Marhold. Chapter 3 Well-being at Work in Belgium: A Matter of Cooperation; F. Dorssemont, K. Naert, A. Van Regenmortel. Chapter 4 Occupational Health and Safety in France: A Good Formal Protection, but a Problematic Efficiency; C. Sachs-Durand. Chapter 5 Germany: Occupational Health and Safety: A Dual System in Change; O. Deinert. Chapter 6 Occupational Health and Safety in Hungary: Changes in the Name of Competitiveness? E. Kovács. Chapter 7 Italy: From Occupational Health and Safety to Well-being at Work; E. Ales, L. Miranda, A. Giurini. Chapter 8 Occupational Health and Safety in Spain: A Formidable Array of Employers’ Liabilities; J. Aparicio Tovar. Chapter 9 Occupational Health and Safety Legislation in a Diverse, Post-industrial Society: A Swedish Dilemma; M. Steinberg. Chapter 10 Occupational Health and Safety in The Netherlands: A Shift of Responsibilities; T. Jaspers, F. Pennings. Chapter 11 Occupational Health and Safety in the UK: At a Crossroads? M. Bell. 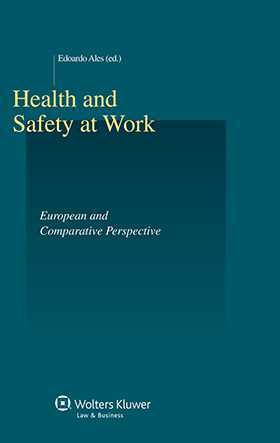 Chapter 12 Occupational Health and Safety: A Comparative Perspective; E. Ales.